Jimmy Graham is a tight end, according to the NFL. 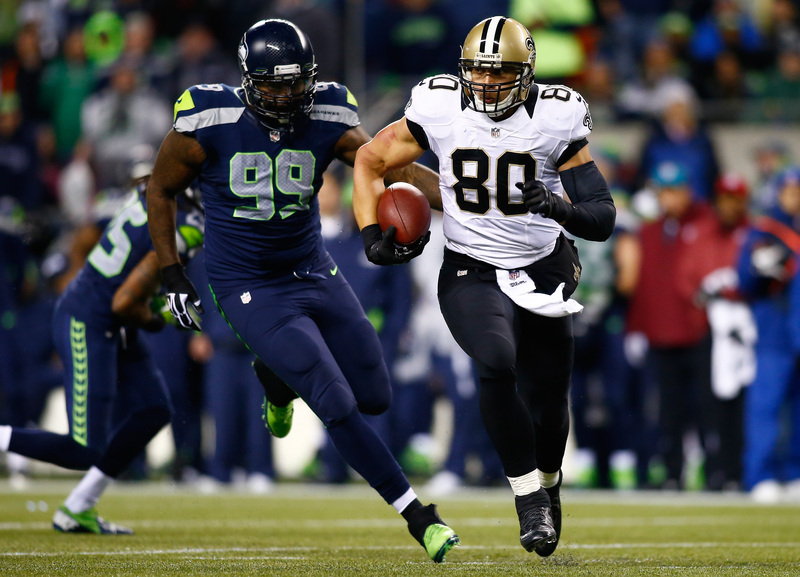 Jimmy Graham is more of a wide receiver, according to Jimmy Graham. And so, when the New Orleans Saints attempted to franchise Graham as their tight end, he pushed back. Franchising, one of the great delayers of free agency available to NFL general managers, gives a player a one-year contract with a salary that is equal to the average of the top five players at the position. As it stands now, Graham is being offered a contract just over $7 million from the Saints. Not a bad bit of change. If Graham was being paid like a wide receiver, though, he’d be set to make about $12 million, so he put the wheels in motion to have the decision decided by an NFL arbiter, the regular course of events for settling contract disputes between players and their teams. The arbiter’s decision came back late Wednesday night, per ESPN, and ruled that Graham was, in fact, a tight end. This is not good for Graham, or his agent, and the player’s union announced an appeal to the decision was pending. The crux of the issue has less to do with Graham as a player and more to do with the multifaceted Saints offense. The basis of the team’s argument boils down to the fact that multiple tight ends around the NFL, especially in recent years — which has seen an explosion of emphasis on high volume passing, have played more downs as an eligible receiver than as a blocker: the two nominal roles of a tight end. From Graham’s point of view, the fact that he lined up wide or in the slot more than two-thirds of the snaps that he played last year indicated that he was, or should be considered, a wide receiver. New Orleans, which has built its team’s offense around quarterback Drew Brees and his ability to liberally spread the ball across each of his available targets, have used Graham as an eligible receiver for years, and it’s painfully obvious that this move to franchise him as a tight end is strictly a cost-saving solution, particularly when his immediate peers were able to avoid being so undervalued by their own teams. According to at least one agent in the video above, a longer, more reasonable deal between the team and the player may be forthcoming. It is notable that even the arbiter, who ruled that Graham was a tight end “because he was within four yards of the offensive tackle for 54.6 percent of his offensive plays,” is clinging to straws here. The sentiment seems to be that even though most recognize that Graham should be paid like a wide receiver, he’s not going to be defined as one. Wink, wink, nudge, nudge.